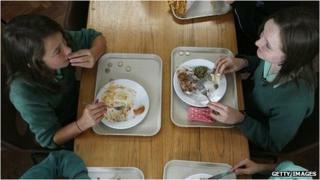 The provision of free school meals for infants in Somerset will cost the county council up to £500,000. A strategy has been approved to build a central production kitchen to cater for the 30% of schools without kitchens. It follows the introduction of a Government policy to provide free meals for pupils under seven in England. The changes need to be made by September. Schools with more than 150 pupils have been asked to pay for 25% of the costs of upgrading their facilities. More than £1m towards improving catering facilities has come from the Department for Education (DfE). Previously the government said it would not cost schools anything to provide the free meals. A spokesman for the DfE said more than £8m had been allocated to Somerset "to support the delivery of Universal Infant Free School Meals", including "more than £1m specifically to improve kitchen and dining facilities". "All schools will receive £2.30 per meal and those with 150 pupils or fewer will receive a share of a £22.5m pot available nationally." "Universal free school meals have been shown, in pilots run between 2009 and 2011, to have a positive impact on pupils' attainment and behaviour and to lead to them eating more healthy food."